NEW CATS 13m &15m STUDY PLANS INCLUDING FULL ALUMINUM CONSTRUCTION DETAILS. 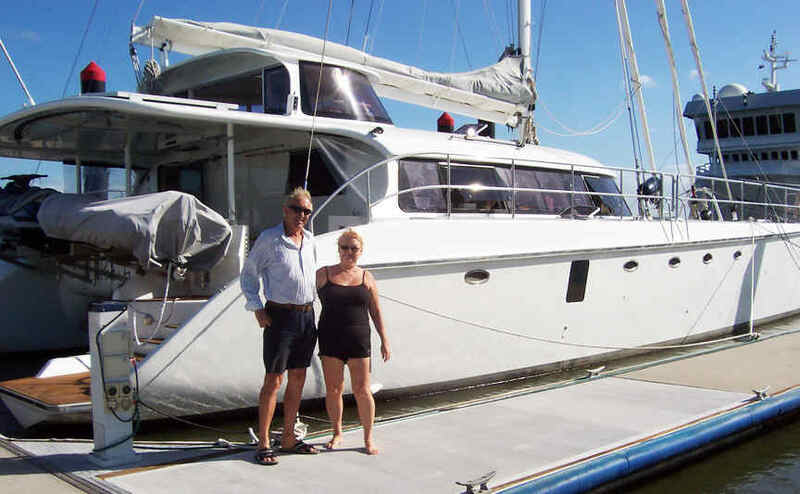 OWNERS COMMENTS: "It is great that with 164 HP twins I can now get 30 knots out of her" "Bruce, I wanted to thank you for all of your help to get to this point, & to let you know how great she turned out. The boat was incredibly stable & responsive. We had to berth the boat twice in difficult cross winds and your hull design, she performed like it was on rails. No problems at all." This is a POWER-SAILER CATAMARAN .. the bias is about 60% power and 40% sail ... the boat can be built as a power only vessel or with the added rig as shown. As for pure sailing CATS; although we have considerable multi hull experience going back to 1961. 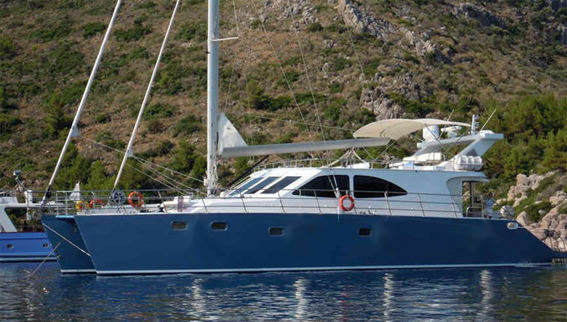 If you want a good Power-Sailer-CAT then the CAT 470 could be your choice. 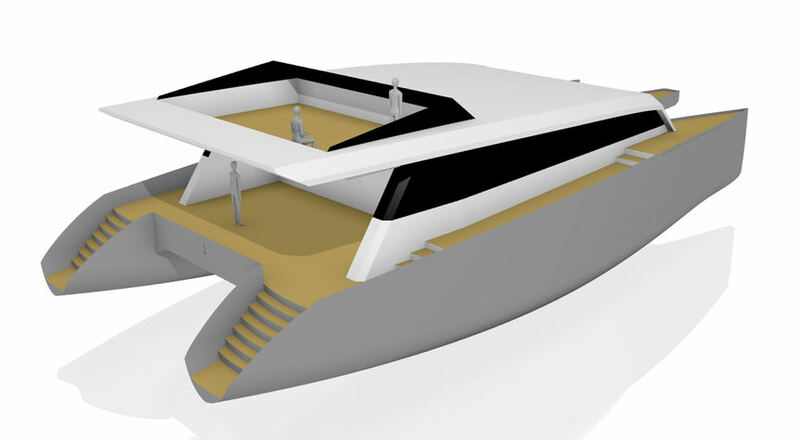 This POWER CATAMARAN was designed to be built using the FIBERGLASS panel construction or ALUMINUM using our CUTTING FILES and boatbuilding techniques. 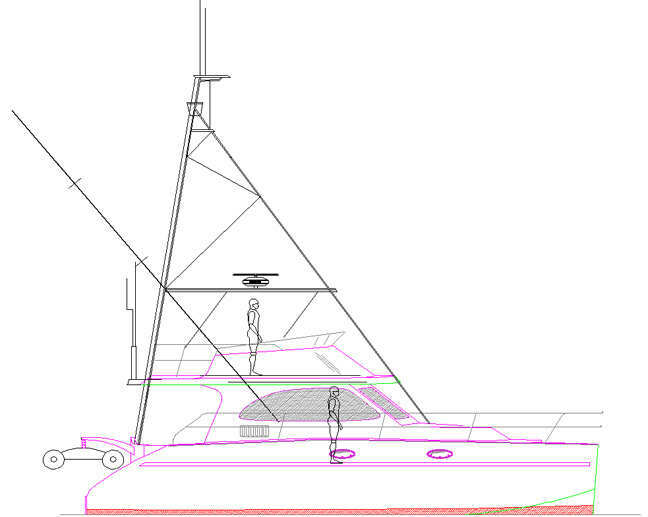 Special pre-scaled drawings are supplied for each hull panel making it simple for the builder to build all of the hull and superstructure as one complete unit. This is a POWER-SAILER CATAMARAN .. the bias is about 60% power and 40% sail ... the boat can be built as a power only vessel or with the added rig as shown. As for pure sailing CATS; although we have considerable multi hull experience going back to 1961. If you want a good Power-Sailer-CAT then the CAT 470 could be your choice. 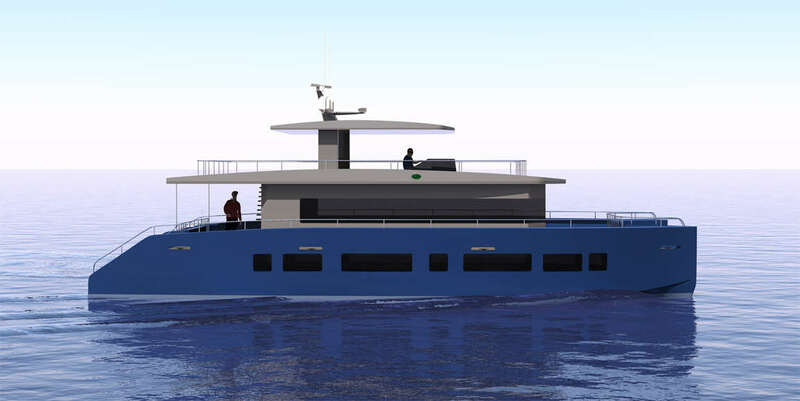 This CATAMARAN was designed to be built using the FIBERGLASS panel construction & special pre-scaled drawings are supplied for each hull panel making it simple for the builder to build all of the hull and superstructure as one complete unit. This is a POWER-SAILER CATAMARAN .. the bias is about 60% power and 40% sail ... the boat can be built as a power only vessel or with the added rig as shown. As for pure sailing CATS; although we have considerable multi hull experience going back to 1961. 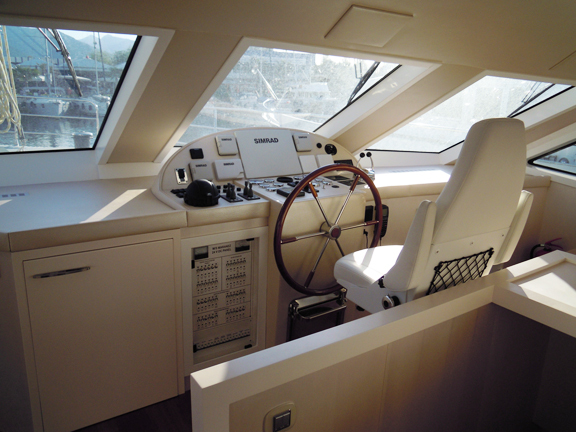 If you want a good Power-Sailer-CAT then the CAT 470 could be your choice. PLANS & FULL SIZE PATTERNS FOR STEEL or FIBERGLASS CONSTRUCTION. 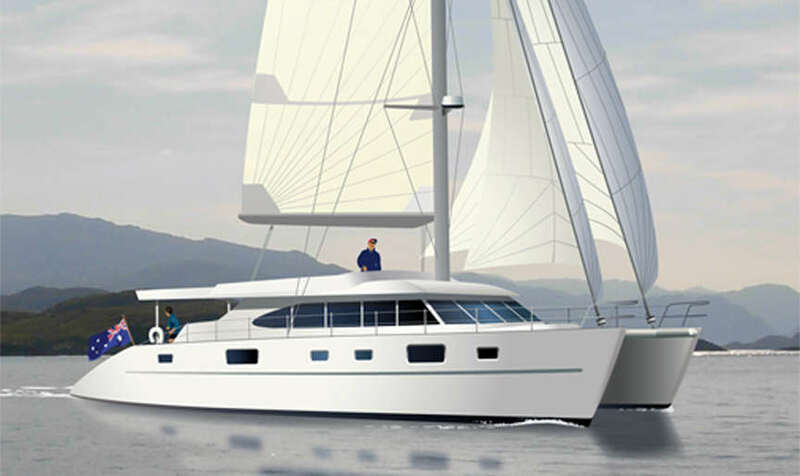 The CATAMARAN 65 MS was designed for personal use or charter work or as a people carrier and the accommodation was laid out with that in mind. 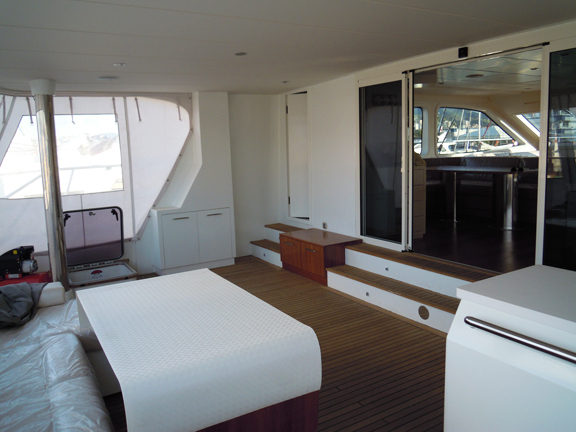 There will be two basic layouts - personal arrangement as shown here plus an arrangement more suitable for charter use. The building technique is well proven as Bruce Roberts has used similar techniques in building radius chine mono-hulled sail boats since the early 1980'S. Work boat and Ferry versions are available. 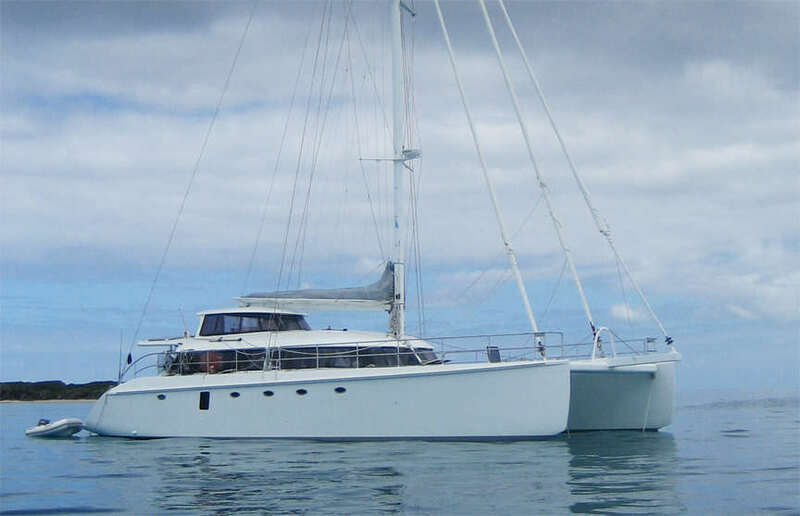 The CATAMARAN 65 MS was designed for personal use or charter work or as a people carrier and the accommodation was laid out with that in mind. 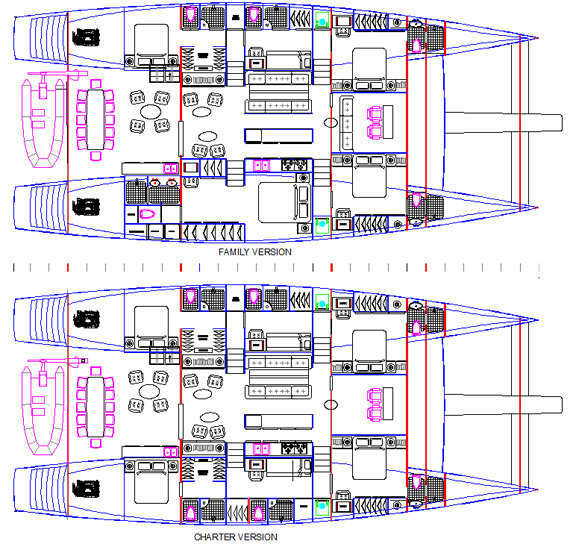 There will be two basic layouts - personal arrangement as shown here plus an arrangement more suitable for charter use. The building technique is well proven as Bruce Roberts has used similar techniques in building radius chine mono-hulled sail boats since the early 1980'S.